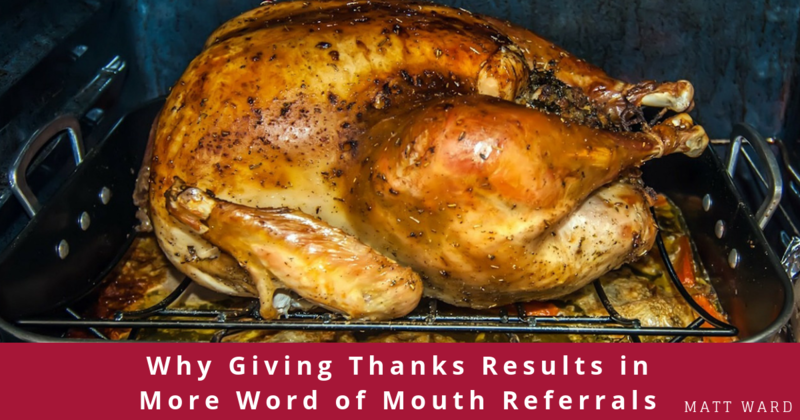 I’m not sure that this topic needs a 600-word blog to describe, but I’ll try to detail my thoughts and distill them down to be concise on why I believe that giving thanks results in more word of mouth referrals. I thought about this topic recently during the Thanksgiving holiday. It’s at this time of year that many people recognize others and thank them for being involved in their lives. With the focus on Thanksgiving and the overall giving season, awareness is raised, across the board. The majority of people don’t make it a point to give thanks on a regular basis. When you find ways to thank people for being who they are, what they bring to the world, what they’ve done for you, your business, your friends, or for any other reason, you are recognizing them for their contributions. It’s a great feeling to be thanked, right? Just like you’d like to be thanked! While you should never thank others with the intention of getting more word of mouth referrals, that is the byproduct of caring and thanking.